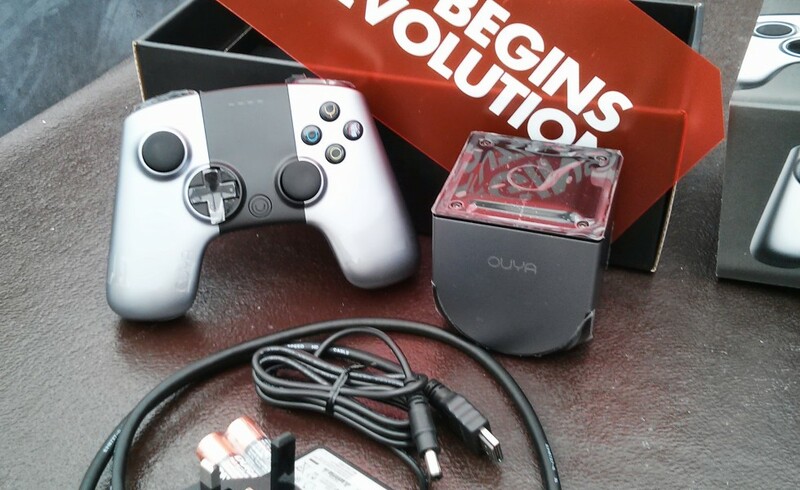 There is plenty online available about the OUYA , its history as a Kickstarter project and its path from obscurity to the limelight of retail; this is not a blog post about those experience. This is a blog post about owning an OUYA for a few weeks and where I want the OUYA to go from here. From day one the packaging and delivery of the OUYA are reminiscent of your first Apple unboxing; it wants to impress you with its message and its size. The tiny little OUYA is no more than a Jam Jar. a provided HDMI lead take its video output direct to the accompanying Acer monitor and the sound is provided by pairing the OUYA over bluetooth to my other favourite tiny sounds system a Technicka Barcelona Bluetooth Speaker. This has to be the smallest console I have connected to a screen. Its tiny proportions hide a robust Android operating system and from there the only downside of the experience was the controller which felt a little underwhelming and distant. Setup wise you will require a credit card ( or prepaid card ) to enable in game purchases and validate your account but they didn’t take any money from me in the setup. Indeed every game on here is free to play with the caveat that levels, features , time limits or other restrictions are enforced until such time as you choose to find that purchase button and buy it. All purchases are in game not on the dashboard and the only downside in this is that no one developer can seem to settle on how to make it obvious to unlock and pay for the products. One final gripe then about payments; I cant lock them or set them to require adult intervention within the game. This means I don’t let my kids play the OUYA unsupervised unless I want to set it up with prepaid credit. Its been several weeks into the game play time of the OUYA in the house of Butler and am I happy with it ? Yes, I am. The game library is expanding and the selections which you can review on the website are getting wider. There is much to offer for party , casual , roleplay and strategy gamer alike. It is not going to replace my Xbox , or the inevitable purchase of the Xbox One , but it sits perfectly between the gap of casual game moments and occasional afternoon distraction. It’s not going back in the box or on the shelf but if I could ask for anything it would be a little better parental controls and an online dashboard from which to manage my account and make game purchases directly. If you get the chance then go ahead and buy the box and experience what might just be the edge of change for the console market as mobiles meet the big screen and consoles seem a little redundant. I think it will be the OUYA that will bridge that gap and be perfectly placed as the place where my mobile purchases will be played on the big screen. ← There was a Gorilla with a Jetpack.